I love using BlackBerry Messenger to keep in touch with family, friends and colleagues – even if they don’t want to talk to me. 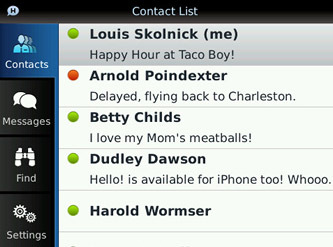 In fact, it’s so quiet on my BlackBerry Messenger sometimes, you can hear a PIN drop (wakka wakka). It’s one of my preferred methods of communication, as it offers an instant messenger experience with a BlackBerry only exclusivity (for now). It’s funny to think about when it first hit my old BlackBerry – the icon was a cartoon headshot of some blonde guy. Now you hear kids throwing around BBM this and BBM that. There was also a time that the BBM exclusivity also excluded us from chatting those using other smartphones with the same ease. True, we have access to options like Google Talk, Windows Live Messenger and such. They do lack one thing that we see in BlackBerry messenger – the ability to see delivered and read notifications. We’ve done some digging and found some alternatives you can load your BlackBerry with. Let’s take a look and see if they’re with all of your OMGs and your LOLs. Now while there are a gaggle of gabbing apps out there, we really wanted to focus on those who offer up some sort of delivery notification. Some can tell if a message been delivered, while others can let you know if it's been delivered and read. PingChat! Just screams messenging on your BlackBerry. 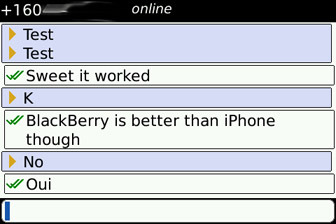 Well, that and the fact that the word ping is also used by your BlackBerry (when you want to ping/nudge a BBM contact). 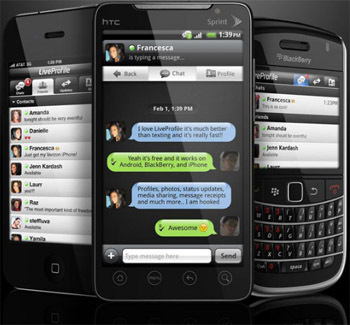 Bonding BlackBerry with Android and iPhone, Pingchat supplies you with media and profile management and a friend finder that accesses your address book as well as your Twitter or Facebook account. The only downside comes when you want to switch devices frequently. You need to un register then re register your ID on the new device. 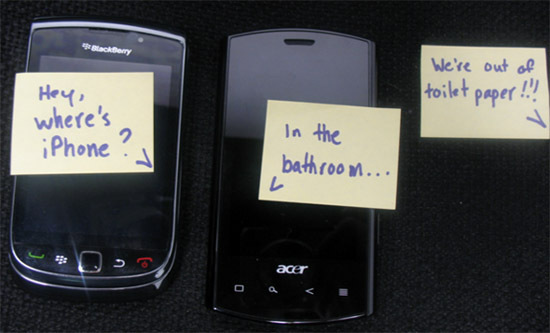 From my experience, BlackBerry users can only see a checkmark when a message is delivered. On the other side of the fence, a user sees an S when a message is sent and an R when it is read. WhatsApp Messenger is compatible with BlackBerry, Android, iPhone and Nokia Symbian60 phones. While WhatsApp cannot provide notification that a message has been read, it can tell you if it has been delivered. First, a single checkmark indicates that the message has been delivered to the servers. The second checkmark says that the message was delivered to the recipient. WhatsApps allows you to manage a list of favourites, enabling you to separate the cool kids from the rest. Speaking of social status, you can manage your own status, (away, busy, etc) as well. From within the app, you have the option to call a contact. This simply redirects you to the native call function. WhatsApp notifications can be modified by your ever useful Profile menu. Keep in mind that in order to send emoticons, you need to be running OS 5.0 or higher. They call it Blazing Fast. LiveProfile plays friendly with BlackBerry, Android and iPhone. One feature that sets it apart is the ability it gives you not only see when the message is delivered, or if someone is typing, but being able to see when the message was read. Yes, I said read. Like BBM, you can set up a profile, status and image. The UI is crisp and easy to navigate. It’s not quite ready for BlackBerry, but the features have me salivating. Users can be added to your contact list by using a unique PIN (sound familiar?). From what I can read, they’re already planning on copy/paste capabilities, as well as group chats and font size options. I say work on BlackBerry first and then you can focus on that other stuff. Cnectd connects BlackBerry users to Nokia Symbian, iPhone and Android users. Garbed in blue and orange, this application is another proud owner of message notification capabilities. 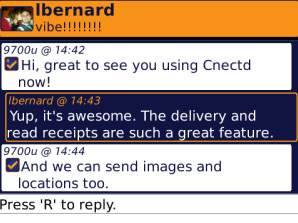 Just like you would see with BlackBerry Messenger, Cnectd slaps on the checkmark with a letter D to mark the message as delivered. To dissipate any doubt that your message viewed, a read message is marked with an (say it with me, like a pirate) R. When accessing your profile, you have the ability to share your location via GPS. For those who want to hide, or are on the lamb, you can turn off this feature. Cnectd also supports groups and allows you to check out who the members are in the groups. Yo! Hey iPhone! Hi Android! Hello! With a happy, frantic wave, Hello! Messenger hopes to gather the geeks, no matter the gadget. You can edit your profile, including; image, status and availability for chat. The app says you can connect using your BlackBerry PIN or with a Hello! PIN. A wave turns into a thumbs up if you ask a Hello! user if they have message delivery confirmation capabilities. You can also enjoy photo exchange options and the ability to make Facebook status updates. More information on Hello! Messenger! With the possibility of running BBM on other platforms in the air, what will the future be for Cross Platform applications? Which one are you using now? Is there one on another platform that you think should make its way to BlackBerry? Let us know in the comments below.